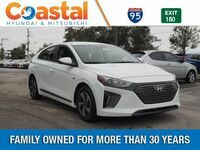 Drivers looking to get behind the wheel of an eco-friendly and efficient vehicle need to look no further than the driver’s seat of the 2019 Hyundai Ioniq Hybrid. This hybrid vehicle offers Melbourne-area drivers an impressive fuel economy and driving range as well as standout features and safety systems. 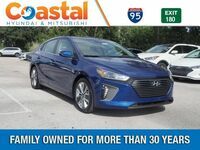 The 2019 Hyundai Ioniq Hybrid is available in three stylish trim levels including the base Blue trim and two elite trims – SEL and Limited. This Hyundai from Coastal Hyundai wears a budget-friendly price tag of $21,650, making this an affordable option for everyday drivers. Are you looking to make the switch to a hybrid vehicle? 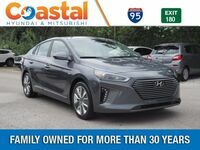 Continue reading to learn about all of the perks of driving a 2019 Hyundai Ioniq Hybrid or click the link below to view our full lineup of in-stock Ioniq Hybrid models. The 2019 Hyundai Ioniq Hybrid is powered by a 1.6-Liter GDI DOHC 16-valve inline 4-cylinder engine paired with an interior-permanent magnet synchronous motor and 6-speed EcoShift® Dual Clutch Transmission with SHIFTRONIC®. This combination has earned the 2019 Ioniq Hybrid an EPA-estimated fuel economy of 57 city/59 highway/58 combined MPG. With an 11.9-gallon fuel tank, the 2019 Hyundai Ioniq Hybrid offers drivers a driving range of 678.3 city miles to 702.1 highway miles. When choosing the Ioniq Hybrid, drivers have their choice of seven stylish exterior color options – Intense Blue, Scarlet Red Pearl, Black Noir Pearl, Summit Gray, Symphony Air Silver, and Ceramic White – to match their personality. Depending on which trim drivers choose, their Hyundai will feature either premium cloth seating or leather seating surfaces to keep them comfortable throughout every drive. Drivers have 26.5 cubic feet of cargo space in the rear of the Hyundai Ioniq Hybrid to give them room for all of their weekend getaway needs. The 60/40-split fold-down rear seat allows drivers to expand their cargo area to make room for bulkier items while still saving space for rear seating. 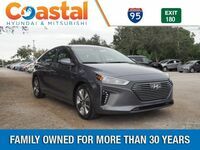 Shoppers looking for more information about the 2019 Hyundai Ioniq Hybrid can click the link below or contact a member of the Coastal Hyundai sales team. We look forward to helping you find your perfect Hyundai.